The princess lines on front and back are feminine and slenderizing. 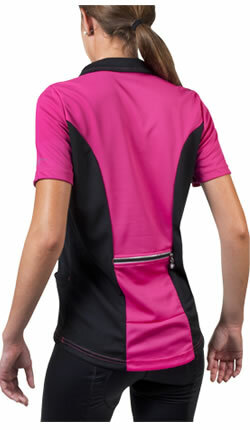 This women's cycling top has received fantastic feedback from our customers who ride a lot. The fit is amazing and it feels great on the bike ride. Made in USA. The fit of the garment is just right for cycling, it stays in place while riding with an anatomically correct cut for the bicycle position. The jersey has a longer back than front and the arms have the extra room needed for the forward position of the arms. 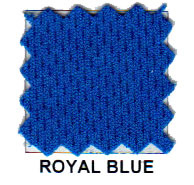 The fabric has a llury feel and great mechanical stretch knitted into the fabric. The material is hydrophobic, so it dries instantly. * Back Pocket is Zippered and easy to reach and zip. * Front Neckline has a 14 inch zipper to help vent heat. * Reflective Zippers on front and back add safety at night. * Two Side hand pockets for convenient access to gel or iPod. * The back pockets of this cycling jersey are set up high enough to prevent seat snags when the pockets are stuffed full. * High quality top stitching details and soft seams. * Technically designed polyester wick away moisture. * True fit designed for American Sizes. * This jersey is cottony soft and very comfortable 100% wick away polyester. 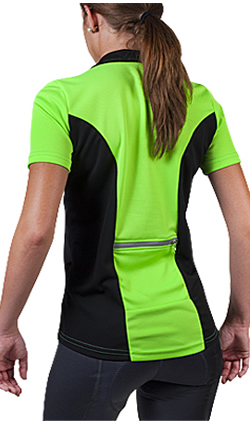 Extra visibility for low light conditions is provided on this bike jersey with a reflective front zipper and a back pocket that is also reflective a the key spot for bicycle riding. No elastic on the hems so that it is flattering and fits comfortable over your hips without tightness. The fabric is a luxury soft, wicking polyester fabric. AeroDri is a channeled polyester yarn that is engineered to transport moisture away from the body and into the outer layer of the fabric for evaporation. The wicking moisture management fabric fabric is the ideal material for wicking perspiration away during fitness activity like bicycle riding. Bicycle Apparel is most often made from high end polyester fibers because of all the benefits offered up by the high end performance of the polyester yarns that are knitted in a way that supports the transportation and evaporation of water vapors that develop during exercise. The 100% Polyester fabric is hydro-phobic which means it does not absorb water or moisture - thus staying dry in heat and wet conditions. The wicking of moisture gives wearer a dry feeling by spreading the liquid to evaporate easily. Hydrophilic fibers like cotton are attracted to and bind with water, meaning the moisture is retained with poor moisture release. Hydrophobic fibers are synthetic like polyester or nylon. These fibers do not hold moisture and depending on their shape, their surface area and their small gaps in construction, the surface has few bonding sites for water to bind. This means the fabric stays dry and has good moisture transportation and evaporation (wicking). MicroFibers are key to the construction of AeroDri™ fabrics because of the fine fiber size and the knitted construction which contains small gaps and big surface areas for evaporation of moisture. Cathy's comments on Fit and Sizing: This bike jerseys really fits great on a women's body, but if you like your clothes loose and airy with lots of space, you wont' do wrong getting a size larger. I wear a size 12 and I wear both the Large and X-large comfortably. I like the size Large a little better because it is very slimming. I like it when I look good on my bicycle...Love to Ride. Warm...wish they had a sleeveless one would buy that too!! Not used to the high tech feel of the material; The fit is great and it launders well. If you are a 16 to 18, a 3x is the way to go. I started with a smaller size and needed to exchange it. A great shirt; the zippered back pocket works fine for me. I bought this to go with my new riding pants and because it was decently priced. I'm a little disappointed, the pockets on the sides are not deep enough (my granola bars kept falling out) and the back pocket is a little high and hard to get to (riding or standing still). Otherwise, the shirt was true to size and comfortable. I love the appearance and fit of the jersey, but I don't like the single zipper pocket. I prefer 3 unzippered pockets in the back of my jerseys. The back zipper pocket scrunches everything I'm carrying together, and I have to unzip this new one to get anything out. The front side pockets are useless because items keep falling out. I am a tall woman from shoulder to hip and this jersey stopped at my belly button in the front. That is not long enough for me. I'm sending this back in exchange for a different style. I have really been enjoying this jersey. I added it to my rotation, but it seems to be the only one I go to now (between washes of course). Had to order up a size just so it was long enough. Shipping was so fast! Wasn't sure which size to get. I normally wear a Small, but got a Large based on my measurements. The large is a bit loose, and I probably would have been okay with a Medium. Better safe than sorry! Overall loved the product! Very very happy! Materials and construction seemed solid, and I like the pocket design. However, although the jersey was not at all snug in the around direction, it was so short that a couple inches of my stomach showed between it and my shorts. I'm 5'8" - not so tall that this should happen. I'd love a version that was 6 inches longer (a tall option along with having plus sizes). This would be the perfect cycling jersey .... nice design, good pocket configuration, except the size runs on the small size. I ordered one to try in size 2X which generally gives me very ample room. This is too snug. If I had not already worn this once to try it, I would return it for a larger size. I am disappointed. This jersey is even better than I anticipated. 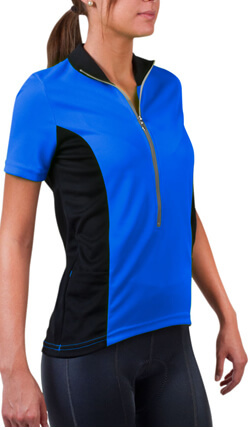 The long front zipper has reflective material to make you more visible to oncoming traffic. The back has a center zippered pocket, also with reflective material. 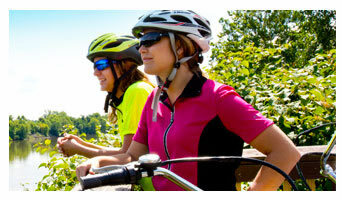 The jersey offers a streamlined, flattering fit. The material is light and breathable - perfect for hot, humid Florida weather. Sizing is accurate. This shirt did not fit well. The arms were too large and long, but the shirt overall was way too short. I'm returning it. For the price, this is a nice bike jersey. I was a little surprised that there is so much of a collar. The picture on the website is pretty small. I was expecting the usual little standup collar but this is more like a polo shirt. But it is nice fabric and keeps one cool while riding. Like the jersey however it would be nice if it had three rear pockets instead of one large pocket. Still a nice jersey. love the top and it is made in the usa!!!!!!!!!!!! Good going guys!!!!!!!!!!!!!!!!! First time to own a cycling jersey. I bought two. They are very comfortable and colors match the pants. Thank you for creating such a nice shirt in my size!! This is the very first cycling shirt I purchased. I tried going by the size chart, but I guess I'm not a fan of clothing that fits like a 2nd skin (being a PLUS size makes one a bit self conscious). I returned the shirt for a larger size, and I feel MUCH better now. I would love to have these shirts in additional colors like: purple, hi-vis orange, and red. I also purchased the long sleeve version, but have not worn it yet. Thank you AeroTech for selling a high quality product at a very reasonable price! This is a cute shirt but not very comfortable. The material seems a bit rough. I normally wear a medium but this one fits a bit too snuggly which makes you even more aware of the rough material. This is a basic, hi-vis workhorse. Love the zippered back pocket- it was the main reason I tried this jersey. The pocket fits my iPhone, car keys and money with room to spare. The side pockets are great, too. I put my cycling gloves in the side pockets during lunch break. The length in the back is nice and long. I did size up to have a looser fit. One thing, though, the colored portion on the yellow one is somewhat see-through. I ordered this item along with shorts and socks a few months ago. When the clothes arrived I was very pleased with the fit and quality. Now after several months of wear and washes, the items still seem like new.